Looking for the perfect sauce to top your homemade pizzas with? 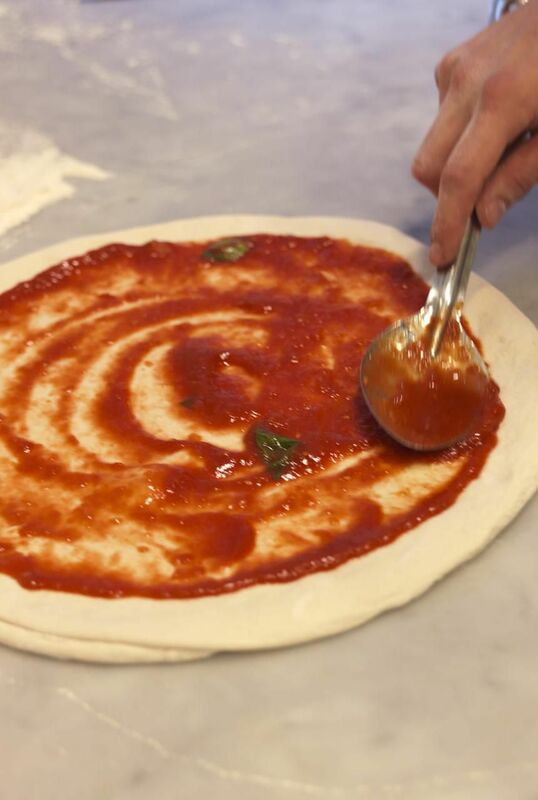 Look no further than this delicious recipe for a classic, New York-style pizza sauce. While Neapolitan-style pizza dictates the use of simply pureed, uncooked tomatoes, New York and other pizza styles utilize a cooked sauce of tomatoes and spices and — gasp — sugar. And, the best part is, this recipe makes more than enough for one pie so you can refrigerate or freeze the leftovers for another day! New York–style pizza is generally large, hand-tossed and thin-crusted, often sold in wide slices to go. The crust is crisp along its edge but soft enough beneath its toppings so that you can fold it in half to eat. This style evolved from a type that originated in New York City in the early 1900s, and today refers to the style of pizza eaten in the states of New York, New Jersey, and Connecticut. Across the Northeast and elsewhere in the U.S., however, different variations exist. Most often, New York–style pizza is hand-tossed, then covered in a light layer of tomato sauce and dry, grated, full-fat mozzarella cheese, with additional toppings on top of the cheese. Pies are typically around 18 inches across and usually cut into 8 slices. The crust of New York–style pizza is typically made from high-gluten bread flour. Typical condiments include dried oregano, dried basil, grated Parmesan cheese, garlic powder, and dried red chili pepper flakes. Push tomatoes and their juices through a food mill or pulse in a food processor until pulverized into a chunky puree. Set aside. In a medium saucepan over medium-low heat, combine butter and oil until butter is melted. Add garlic, oregano, red pepper flakes, and salt and cook, stirring, about 3 minutes. Add tomatoes, onion, and sugar. Bring to a simmer, reduce heat to lowest setting, and cook, stirring occasionally, for about 1 hour. Add more salt if necessary. Remove and discard onion. Let cool and store unused portion in a container in the refrigerator for up to 2 weeks, or pour into zip-top bags and freeze. This sauce tastes great atop our Basic Pizza Dough. Feel free to add any additional toppings you like, from basic mozzarella to the more creative Spanish Chorizo and Serrano Ham Pizza. This sauce also makes a great dipping sauce for​ homemade garlic knots.